Drawing together a team of expert contributors from across the sector to offer contemporary descriptions and critical reflection of practice in higher education, Influencing Higher Education Policy uncovers the nature of policymaking and interpretation. With a range of authors whose experiences range from governmental to academic, this book shares insights from professionals working in the field of higher education policy to provide useful, practical and implementable information. 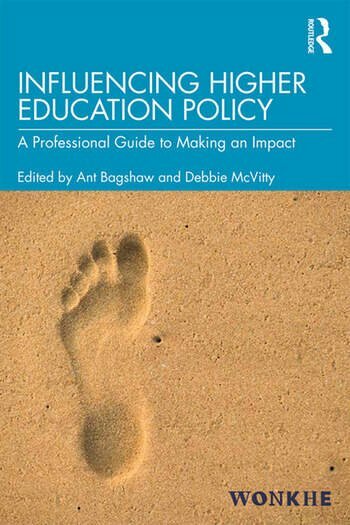 Offering a contemporary representation, Influencing Higher Education Policy is an indispensable guide for all those who work in higher education, particularly those who work in communications, strategy, planning and leadership roles. Power and influence in higher education policymaking: who controls the debate? Ant Bagshaw is a management consultant at Nous Group working across its Australian and UK education practices. Prior to joining Nous, he was Deputy CEO at Wonkhe. He has also worked as a policy and projects officer for senior management teams at the London School of Economics and University of Kent, and in a policy development role at University College London. Debbie McVitty Debbie McVitty is Editor of Wonkhe. Debbie is a former Chief of Staff at Universities UK, policy director at the University of Bedfordshire and the National Union of Students, and a founding member of Wonkhe’s editorial group.